On behalf of Guidestone’s Board of Trustees and staff, I would like to extend a resounding thank you to everyone in the community that participated in our 5th Annual Pumpkin Patch at Cottonwood Meadows. Thanks to gorgeous fall weather and such a supportive community, this was our most successful event yet. We are delighted at this year’s turnout, with more than 1700 people in attendance over the two weekends’ festivities! 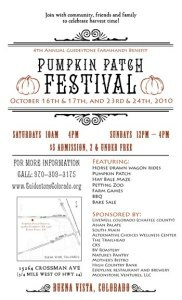 We would like to specifically thank the following individuals, organizations and animals for helping make the Pumpkin Patch such a great event: Weathervane Farm & Cottonwood Creek Dairy staff and family of farm animals, John Cogswell, Colorado Grown Distribution Center, Ralph Ogden and his team of wranglers, draft horses and ponies from Arkansas Valley Trail Rides, Dennis Fischer and his mule team, the Chaffee County Fire Protection District, and all of our hard-working and positive volunteers: Angie Jensen, Ashley Blazer, Ben Walker, Bev Palm, Bill Earley, Chrissy Supples, Danielle Riggio, Jane Lambard, Jessica Adamson, Jessica Pettee, Joan & Randy Roberts, Josh Visitacion, Karen & Will Berry, Katrina Clark, Kira Cunningham, Kristine Smock, Maude Perschbacher, Naomi Allen, Paul Hauser, Rebecca Owens, Sarah Mudge and Travis Colbert. for ecological literacy. LiveWell Chaffee County, The Boathouse Cantina, Landmark Surveying and Mapping, Arlie Dale’s Jug Liquors, Arrowpoint Cattle Company, Brady’s West, Buena Vista Roastery, The Eddyline Restaurant and Brewery, Erin’s Organics Geothermal Greenhouse, The Evergreen Café, GOTO Guide, Headwaters Outdoor Equipment, Heart of Colorado Vacations, Kaleidoscope Toys, The Maverick Potter, The Mixing Bowl, Moonstone Ventures, Mother’s Bistro, Natural Habitats, Nature’s Pantry, Susan Dempsey Hughes (Pinon Realty), Rebound Physical Therapy, Rise and Shine Bakery, Salida Bread Company, Salida Mountain Sports, Simple Foods and Southwest Conservation Corps. Check Out This Weekend’s Pumpkin Patch & Community Events! Join us for hayrides, petting zoo, face painting, pumpkin picking, pony rides, and hot apple cider and lunch, and more! Admission for adults and children three and over is $5; children two and under are free. 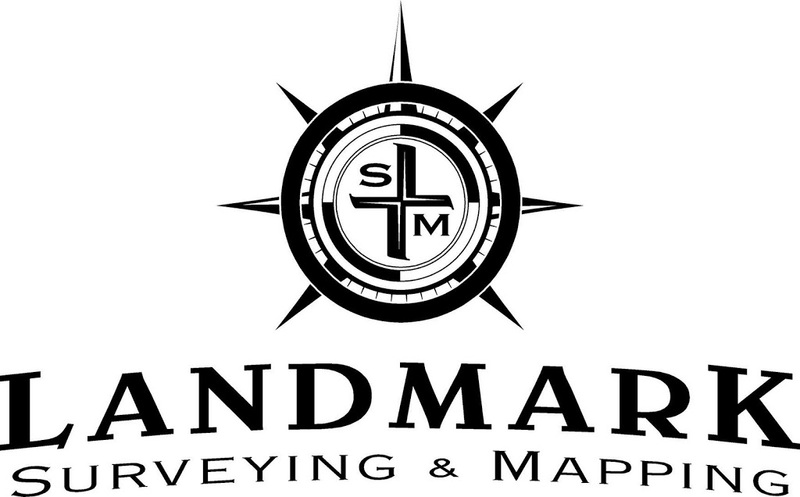 All proceeds support Farmhands, Guidestone’s Educational Program. Special thanks to our hosts and sponsors! 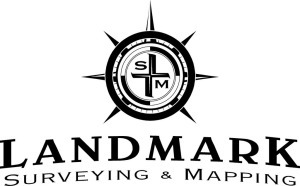 Salida Steamplant Event Center, 8:30 a.m. – 10:00 p.m.
Workshops from 8:30 a.m. – 3:30 p.m.; Silent Auction 11:00 a.m. – 9:30 p.m.; Live Entertainment 7:00 p.m. – 10:00 p.m. Autumn in the Upper Arkansas Valley is a wonderful time to celebrate with seasonal festivities around the abundant harvest. One great event for children and families will be the Fourth annual Pumpkin Patch Festival at Cottonwood Meadows in Buena Vista. The Pumpkin Patch Festival is a two-weekend celebration open to the public, which offers a variety of activities and amusements for the whole family. You can join in on a horse-drawn wagon ride pulled by a local team of horses. 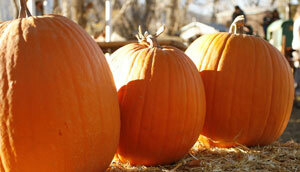 The team will pull you out to the pumpkin patch where you can pick the perfect pumpkin for Halloween. Other engaging activities include winding through the hay-bale maze, playing chicken bingo, and enjoying a barbecue bratwurst or burger lunch with hot-apple cider and homemade pies and cookies. There will also be arts and crafts for the children, farm games, face-painting and a petting zoo. Enjoy the sights and sounds of life on a farm with your friends and neighbors while enjoying the fall colors of the cottonwoods and the views of Mt. Princeton. You can build a scarecrow. Watch local artisans share their skills and wares. 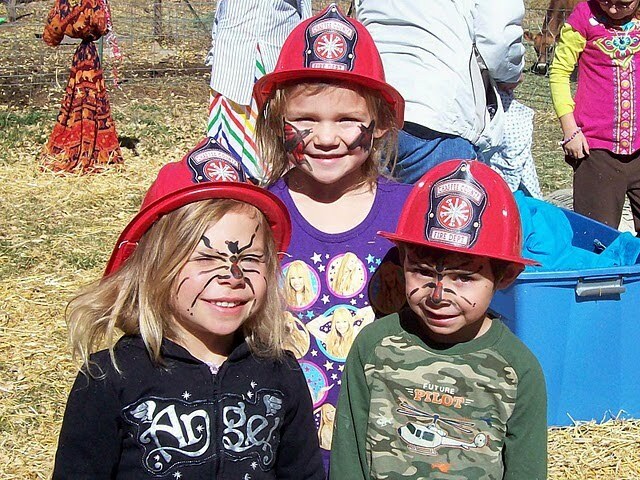 Visit the fire trucks and learn about fire safety with the Chaffee County Fire Protection District. Take a walk back to the beautiful meadows along Cottonwood Creek. 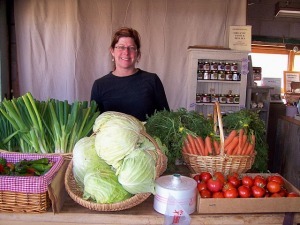 See the gardens where Weathervane Farm grows the vegetables provided to you through the CSA and markets all season long. 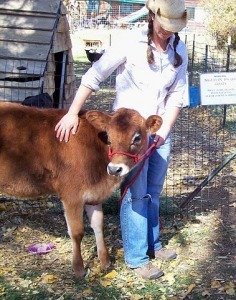 Be sure to check out Cottonwood Creek Dairy and learn about old-fashioned raw milk production. And don’t miss Colorado Grown, a distribution center specializing in locally grown and Colorado-based farm and specialty products. Admission is $5 for adults and children three and over – the tiny tots are free! The cost of admission and the proceeds from the barbeque and baked goods will support Farmhands, Guidestone’s educational programs. Guidestone is a non-profit organization that serves the Upper Arkansas River Valley by encouraging our local food economy and preserving our agricultural heritage with the Land-Link Initiative. The Farmhands Education Program, a Guidestone project, aims to join children with the hands-on learning experiences of small-scale local food production. Location: 15264 County Road 350 (look for the pumpkin signs! ), Buena Vista. 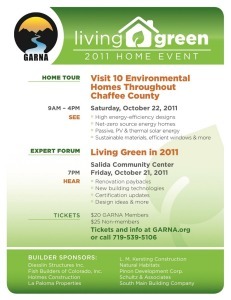 For more information go to www.guidestonecolorado.org. Special thanks to John Cogswell of Cottonwood Meadows, Weathervane Farm, Cottonwood Creek Dairy, and Colorado Grown for their ongoing support. 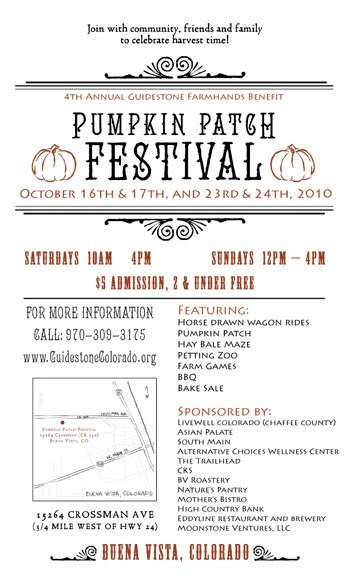 Guidestone’s Pumpkin Patch is an annual event, hosted over two weekends in October, which provides a festive celebration of the harvest season for children and families. Activities include crafts for kids, a hay bale maze, face painting, pony rides, and a horse drawn wagon ride out to a pumpkin patch where children can pick their own pumpkin to bring home. For three years the event has been held at Cottonwood Meadows in Buena Vista, where there are farm animals to visit and Weathervane Farm’s beautiful gardens to peruse. Or participants can take a walk through the golden leaves of the Cottonwood trees along Cottonwood Creek. Music and food round out the festive atmosphere. This year, our 3rd annual, was the most successful one yet, with around 1000 people in attendance over the two weekends. People came from Chaffee, Lake, Fremont and Eagle Counties to enjoy this abundant time of year. All of the event’s proceeds go to support Guidestone’s Farmhands Education Program, which provides hands-on, experiential farm & nature-based education programs to groups, children and families. Community support is invaluable to the success of these programs, and Guidestone is grateful to everyone that attended this year for appreciating and celebrating agriculture, community and education. We would also like to thank the farmers, volunteers, and the folks at Cottonwood Meadows for their continued support of this festival. Autumn is a time of color and wonder in the Arkansas Valley and there’s no better way to celebrate it than to take part in its seasonal festivities. 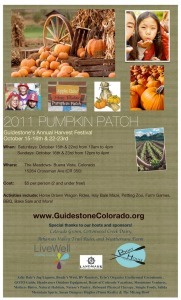 One such event will be the third annual Pumpkin Patch Festival at Cottonwood Meadows in Buena Vista. The Pumpkin Patch Festival is a two weekend celebration open to the public which offers a variety of activities and amusements for the whole family. You can join in on a horse-drawn wagon ride pulled by a local team of horses. They’ll pull you out to the patch where you can pick the perfect pumpkin. Bring it back and carve it at the farm. Or, if you’d prefer, you can carve it at home and spend your time running through the hay-bale maze, playing cow-pie bingo, bidding in a silent auction, enjoying a barbecue lunch, sipping hot-apple cider and enjoying homemade pies and cookies, bobbing for apples, visiting and petting the rabbits, horses, calves, ducks, chickens, dogs and more. 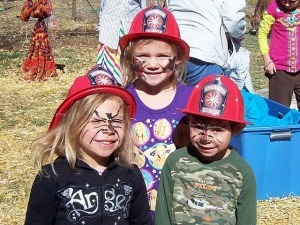 You can have your face painted, see fire trucks and learn about fire safety with the Chaffee County Fire Department, take a walk through the gardens or back to the beautiful meadows along Cottonwood Creek. Be sure to visit the raw milk dairy and Colorado Grown, a distribution center specializing in locally grown and Colorado-based products.